Anyone who really knows me knows that I am always in the midst of obsessing over some celebrity or occasionally, group of celebrities. It has never been unhealthy; I have never purchased “used tissues” or anything ridiculous like that. I used to get judged a great deal by my peers for having them in my earlier education (most specifically in middle school). It took many years of feeling super self-conscious and borderline embarrassed about having these celebrity fascinations until I finally understood why I had them. Each celebrity that I have ever put on a pedestal has taught me a very valuable lesson that has contributed to the person that you all know today. I have never tried to make of myself an IDENTICAL model of one of my favorites, but rather, I take bits and pieces of their outlooks and apply them in different aspects of my life. I also really admire these people as artists and think that what they do matters immensely. Dianna Agron: I’m always in a Dianna phase. Even when she is not at the forefront of my mind, she remains on the back burner and I’m thankful for that. Dianna taught me the importance of enjoying life. It’s that simple. She always looks like she is having the time of her life. Even when at the market shopping around for groceries, she has a huge smile plastered on her face and I so admire that. Once I learned to start viewing everything thing I did as an opportunity for a great time, my life improved immensely. I’m not suggesting that EVERY situation will be fun, but if I make the most out of mundane experiences, I’m bound to have a fun life. Barbra Streisand: I honestly feel that EVERYONE should go through a Streisand phase. The most important thing I learned during the Streisand phase is that if you put passion into what you’re doing, it’s going to be good. Barbra milks every single song she sings and it’s because of the sheer emotion that goes into her actions. I decided that if I was going to do something, I was going to put my heart and soul into it and do it big. Stevie Nicks: Without a doubt, Stevie is one of the most influential people in the entire world. Walk into ANY populated establishment, start playing “Landslide” on a guitar, and see if everyone in there doesn’t immediately start to sing along. Stevie means so much to me because she advocates for passionate women. It is important to her to know that what she is doing makes a difference. She is so ethereal. Stevie taught me to keep my mystery and to always, always, always express my emotions. Too often, I keep them bottled up and that kind of behavior is so toxic. To me, she represents strength. She has made some incredibly hard decisions in her life and even though she admits she wishes she had occasionally chosen differently, she stands by her choices and if that’s not the most admirable thing you’ve heard in a while, I’d love to hear what is. 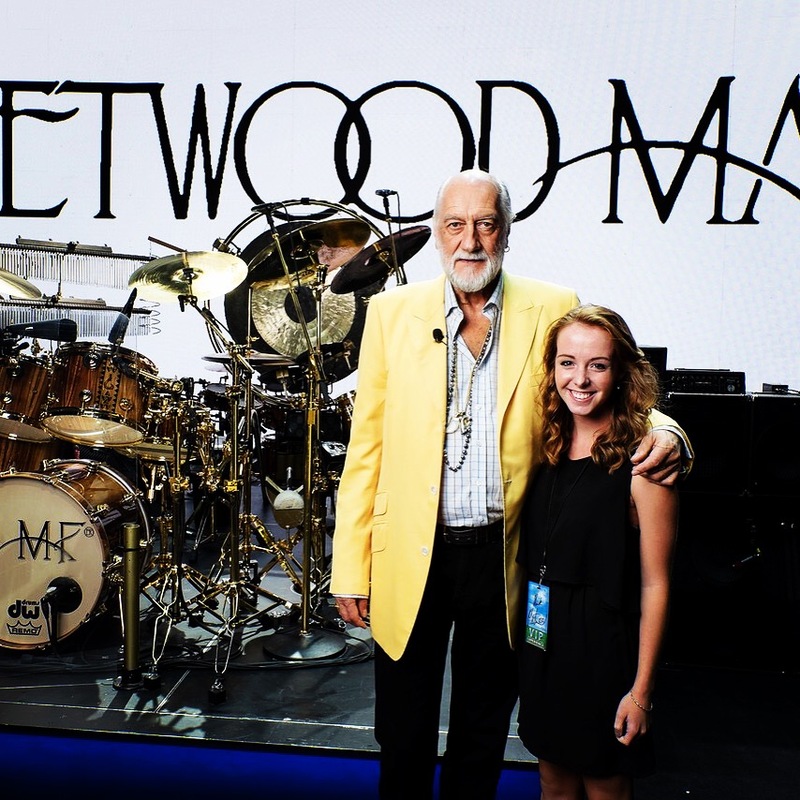 Fleetwood Mac: My all-time favorite band. Period. Their music is so powerful. The lyrics are filled with so much depth and their harmonies are haunting. The tension/chemistry between the members is the most amazing thing to watch. You can HEAR and FEEL them communicating with each other through the music. The dynamic between Stevie and Lindsey will never cease to amaze me. What I learned from them is that sometimes, people are meant to be in your life even when you can’t stand them or when it hurts to be around them. “The Chain” is an intangible thing that really does keep people together despite all of the differences in the world. ONJ: Our latest Monday muse taught me to prioritize my well-being. It is so important to be healthy in ALL aspects of life. I try to run at least three miles a day, I eat salads…I try to ensure that my physical health is being maintained. What I didn’t consider, however, is what most others forget to consider: my mental and emotional health may be subpar. I struggle with anxiety, so I really should begin to prioritize my mental well-being. Olivia taught me that there must be a balance. I could be the most physically-fit person in the world, but it matters naught if my head is in a mess and my mindset is negative. She is honestly one of the most encouraging human beings alive and the fact that she uses her fame to advocate for health and well-being deserves the biggest round of applause in the entire world. There are MANY more celebrities whom I admire, but I am already at 1.000 words. Like I said, it took me a very long time to become okay with having such influences in my life. There were many times I felt like I was being constantly judged by those surrounding me, and if truth be told, that feeling hasn’t entirely gone away; however, I now realize that the things my favorites have done for me far outweigh the slight embarrassment I feel when people put me down for having them. I don’t expect any of you to understand this post because I don’t expect any of you to know what these people truly mean to me. I know that they are far from perfect, but so is literally everyone else. Only I can know the vast impact that the people listed on this page have for me and at the end of the day, that’s really all that matters. Some people follow sports, I follow celebrities. Don’t tell me that you’ve never bought a jersey in order that you may proudly represent your favorite athlete. If any of you would like to talk with me about celebrities, I am begging you to do so because I love nothing as much. I hope you all have a blessed rest of Sunday and week ahead! Love and light to all!